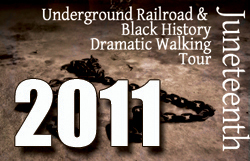 On the first stop of the 2012 Juneteenth tours, an ex slave confronts his former owner. In the summer of 1865, a former slave by the name of Jourdan Anderson sent a letter to his former master. And 147 years later, the document reads as richly as it must have back then. The first stop on the 2012 Juneteenth Tour is next door to the newly opened Pauline's Diner. This shady ally was a perect position to conjure the past. This Tour is thematically driven by the idea that there is much one MUST do once one has gained freedom. As a staring point of the tour, this piece and its accompanying song, clarifies the first thing you can do with your freedom. You can demand respect, safety and what is do to you...You can also employ sarcasm without fear of the lash. The second stop of the 2012 Junteenth tour is in front of the Norristown FOP memorial at Hancock Square. Seidah Hill brings Sojourner Truth to live as she shows that the cause of women and the cause of African Americans are linked and that women may need to step in to get the world turner right side up! Richard Bradford brings a story of danger and discovery in the South to life. Dr. Joseph Holloway is a professor of Pan-African Studies at California State University at Northridge. Born and raised in Los Angeles, Dr. Holloway recalls his first trip to the South and the horror of witnessing a lynching in Texas. This was the 4th stop on the 2012 Juneteenth tours in Norristown. Rev. Dr. Martin Luther King Jr's speech on the topic of social justice, delivered to an audience at Western Michigan University in 1963 performed by Walter DeShields.The broadened ideas of King, moving into a variety of social and political issues, is set in the stone walled back court of the Montgomery County Courthouse. Episode 5 from the 2012 Juneteenth tour produced by Iron Age Theatre in Norristown. This clip features Bob Weick as Zinn, Weick has been performing Howard Zinn's Marx in Soho since 2004 and is an advocate for social justice. He knew Zinn and this piece seems to channel Zinn's vibe. In scene 6 of the 2012 Juneteenth, Maurice Tucker brings Fred Hampton Back to life to talk about socialism and social justice. Fred Hampton was born in Chicago on 30th August 1948 and grew up in Maywood, a suburb of the city. Hampton founded the Chicago chapter of the Black Panther Party in November 1968. Sylvia Woods, played by Tiffany Joyner, is stop 7 of the 2012 Juneteenth tour from Iron Age Theatre. Woods recounts her experience with segregation and rebellion when as a girl she refused to sing the National Anthem. This is an alternate take of the closing poem of Juneteenth 2012. A different angle, a different sound, and some editing of the premiere of this new work by regionally recognized poet Mydera Robinson. It is exciting to hear her use of radical and inflamitory ideas as part of her speech in a much more conservative time. Truth's humor and passion are apparent in this speech. The piece is performed in front of the Norristown FOP memorial at Hancock Square. The Third stop on the tour is on Swede Street near the stairs to the County Courthouse's 911 memorial. Richard Bradford brings a story of danger and discovery in the South to life. Dr. Joseph Holloway is a professor of Pan-African Studies at California State University at Northridge. Born and raised in Los Angeles, Dr. Holloway recalls his first trip to the South and the horror of witnessing a lynching in Texas. This was the 4th stop on the 2012 Juneteenth tours in Norristown. Rev. Dr. Martin Luther King Jr's speech on the topic of social justice, delivered to an audience at Western Michigan University in 1963 performed by Walter DeShields. The broadened ideas of King, moving into a variety of social and political issues, is set in the stone walled back court of the Montgomery County Courthouse. Episode 5: Howard Zinn: What I learned from Spelman College.. Episode 5 from the 2012 Juneteenth tour produced by Iron Age Theatre in Norristown. This clip features Bob Weick as Zinn, Weick has been performing Howard Zinn's Marx in Soho since 2004 and is an advocate for social justice. He knew Zinn and this piece seems to channel Zinn's vibe. Howard Zinn (August 24, 1922 - January 27, 2010) was a historian, playwright, and activist. He wrote the classic A People's History of the United States, After attending college under the GI Bill and earning a Ph.D. in history from Columbia, he taught at Spelman, where he became active in the civil rights movement. After being fired by Spelman for his support for student protesters, Zinn became a professor of Political Science at Boston University, were he taught until his retirement in 1988. This piece accents the power of the black movement on white America. Episode 6: Fred Hampton: Fight Fire with Water. In scene 6 of the 2012 Juneteenth, Maurice Tucker brings Fred Hampton back to life to talk about socialism and social justice. Hampton's tragic story gives weight to the clarity and directness of his examples. Hampton's speech is full of politically charged language but is not imprisoned by ideology. Humanity first! Fred Hampton was born in Chicago on 30th August 1948 and grew up in Maywood, a suburb of the city. Hampton founded the Chicago chapter of the Black Panther Party in November 1968. He immediately established a community service program. This included the provision of free breakfasts for schoolchildren and a medical clinic that did not charge patients for treatment. Hampton also taught political education classes and instigated a community control of police project. One of Hampton's greatest achievements was to persuade Chicago's most powerful street gangs to stop fighting against each other. In 1969, the Black Panther headquarters was raided by the police for the fourth time. The police later claimed that the Panthers opened fire and a shoot-out took place. During the next ten minutes Fred Hampton and Mark Clark were killed. Witnesses claimed that Hampton was wounded in the shoulder and then executed by a shot to the head. Episode 7: Sylvia Woods: Until I Can do What the White Kids Do. Sylvia Woods, played by Tiffany Joyner, is stop 7 of the 2012 Junteenth tour from Iron Age Theatre. Woods recounts her experience with segregation and rebellion when as a girl she refused to sing the National Anthem. Her story accents the brilliant rebellion possible by the young. It also forces us to examine the position of blind patriotism to a society that is unequal and exploitative. Woods takes a bold stand, one that would be quite hard today, and does it for the very ideals that she feels are represented in the thing she is rebelling against. The practical application of freedom is as important as its presence on a piece of paper. The final stop of the tour in 2012 is the only original piece of the event. Mydera, a Norristown resident and regional performance poet regularly seen in Philly makes her debut in her hometown with this poem, written especially for this event. Mydera was asked to craft a poem about freedom and Norristown. The words and the performance are hers. It is a magnificent piece that encapsulates her vision for humane treatment of all in the context of Norristown. Visit out YouTube page to see another version of this same poem. Event Sponsors:Upward Bound, Health Partners, Norristown NAACP, Milligan and Co. LLC, The Norristown Arts Council, H and H Realty, The Centre Theater.